There are Chinatowns and then there are Chinatowns. My favorite in this country is San Francisco's, with its narrow streets teeming with people and smells, the shops jammed to the rafters with kitchenware, plastic shoes, brush paintings, anything you could imagine. And unmarked doorways leading up dark stairways to restaurants that only locals know about. And then there's Portland's miniature version, tucked into a few blocks of Old Town. We even have our own hangout for the locals. Called Good Taste, it's squeezed into a tiny storefront behind a bright pink facade. People in the know have said it makes some of the best Chinese food in town, and judging by the wonton noodle soup I had for lunch the other day, I'd say they're right. Distinctly different from pho, the broth is much more pungent but still has the soul-warming richness of the Vietnamese-style soup. It comes with a choice of wontons, noodles, duck or pork, or you can choose to have both noodles and wontons with your protein. Wonderfully moist and tender, the wontons are little packets of delight, and with a few drops of chili oil and some of the broth you'll swoon. I can't wait to go back and try more! Details: Good Taste Restaurant, 18 NW 4th Ave. Phone 503-223-3838. Oh God...that looks sooo unbeleivably good right now. Cong and I went there a few years back and loved it. We definately have to make another trip soon. I know...it was really great. And I'm serious about trying the other stuff they have. It all looks good! You've got it right! My husband is Chinese and that's where we go to eat, though it's nowhere near as good as SF or Oakland's Chinatown (where we come from). His parents say that King Wong's in Portland is also good. It's nice to be validated! I've been to Wong's King and, while the food is perfectly fine, it's a little upscale mall-feeling to me. I like the funky (but clean). My brother wrote that Om Seafood is where his (future) father-in-law, who's apparently a fantastic Chinese chef, likes to go. There's also a good taste on SE 82nd, in a strip mall just north of Fubonn. It's a bit less divey (thus has less personality), but their BBQ pig and duck by the pound I've found is better. 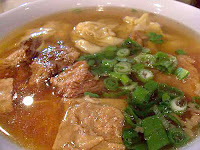 I've only had the won ton soup at Chinatown location, though. And, btw, GC, nice site (re-?)design. Very tumble-log-ish! Did you do it yourself, or is it a template?